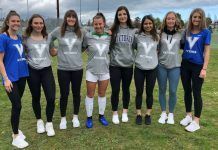 VICTORIA— One day after a disappointing defeat, the UVic Vikes came back onto the turf at Centennial Stadium looking like a different team en route to defeating the UNBC Timberwolves 2-1. 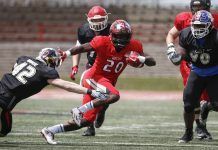 “I thought we showed today that we were definitely the better team on the day,” said Vikes head coach Bruce Wilson. Isaac Koch and Tarnvir Bhandal netted the Vikes goals, with James Stephens answering back for the Timberwolves. The win kept the Vikes playoff hopes alive, slim though they may be. UVic needs to win the two remaining games on their schedule and hope that the teams above them falter in their last weekend of play. The Vikes came out of the gates with intensity, looking to redeem themselves for the loss last night. “We used a lot of fresh players today and they (UNBC) used a lot of the same players. We brought in seven new players today and it certainly made a difference because they were tired, no question about it,” said Wilson. Koch got the Vikes on the board in the 17th minute of play when the second-year midfielder took advantage of some confusion in the UNBC defence to slip the ball between Mitch Macfarlane, in net for UNBC, and the post. “We set out with the goal of getting at least a point today and we wound up behind due to our own sloppiness so we knew had to score,” said Timberwolves head coach Steve Simonson. The Timberwolves equalizer came in the 57th minute. Defender Emmanuel Drame did well to chest down a ball right into the path of Stephens, who powered the ball past Vikes goalkeeper Jasdeep Lally. The Vikes kept on coming though and their significant shot advantage paid off with a goal late in the game. Evan Stefanek whipped in a cross that Bhandal was able to direct into the net. UNBC did their best to equalize, but the Vikes defence stood firm through the last minutes of the game. UNBC will travel to Abbotsford to take on the third place Cascades in a pair of game on October 21 and 22. The Vikes will stay at home to welcome the Thompson Rivers WolfPack and UBCO Heat on October 21 and 22. Both the WolfPack and Heat sit just ahead of the Vikes in the race for the play offs.